Cornelis Raaphorst was an autodidact who began with painting still-lives, later adding flowers and landscapes onto his repertoire. 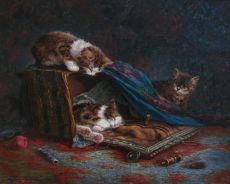 He eventually specialized in the painting of kittens, which earned him some fame in the Netherlands during the first half of the 20th century. Recently his paintings have become quite popular on national as well as international art fairs, thanks to the lush and... Read moreCornelis Raaphorst was an autodidact who began with painting still-lives, later adding flowers and landscapes onto his repertoire. He eventually specialized in the painting of kittens, which earned him some fame in the Netherlands during the first half of the 20th century. Recently his paintings have become quite popular on national as well as international art fairs, thanks to the lush and sumptuous atmosphere which they portray. Remarkably though, Raaphorst was actually a very poor man whose family relied on him to provide for them through his artistic endeavours.